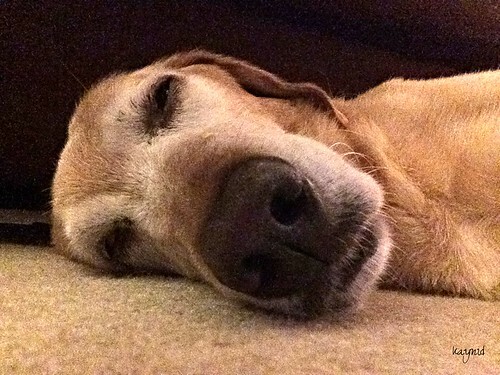 Here's Daisy pretending to be half-awake or half-asleep. This photo makes me laugh every time I look at it. I think she just finished playing catch with Kepi when I took this photo, so she was probably tired from all the running and catching. I have to say that at 13 years old, she has the exuberance of a puppy. We adopted Daisy from a rescue group in 2014. When we first met her, we bonded right away and we instantly became a family. She was my therapy dog during my long recovery from transplant. She's my angel. Well, she's not totally angel-like. We know she tries on every seat or couch in the house when we're not at home. She also ate the 16 party cupcakes I baked and left for cooling on the dining table. And most recently, she managed to reach the bacon on the high stove. Poor Kepi couldn't make his BLT sandwich when he came home. Well, no matter, we still love Daisy - naughty or nice. Your dog is adorable, though. She is adorable, and we love her to bits. Daisy is such a perfect name for pets. My friend's dog is also named Daisy and also look like your Daisy, prolly the same breed. I am so glad that my two cats are not at all interested in human food. They sniff, never lick much less bite any unattended human food on the table. You're right because one of our neighbor's dog is also named Daisy and of the same breed. I know, I sometimes think Daisy thinks she's human. Awwww - she is precious! Yes, she is. Thank you for coming. Having an animal at home is just such a wonderful thing. I don't know what I would do without our cat - and he can be naughty sometimes, too. I'm sure she has so much energy because she's so deeply loved by all of you. I agree. Having an animal at home brings a different type of happiness. Daisy acted as my therapy dog while I was recovering. She never left my side. I was so worried the day she ate all those cupcakes. Luckily, she was fine and was out running again the moment I opened the door. Hugs back and thank you for visiting. What a cute photo! Wow at the 16 cupcakes she ate. I hope she was ok after eating the sugar. Thank you. I was really worried when she ate all those cupcakes, but she was fine. I think she did have a sugar rush because she was out running at the backyard when I let her out. Great portrait of a good looking animal. Have a blessed day. Oh yes, she had a feast. Thank you for visiting. Being that cute I bet she got away with all that yummy food. MOL. I actually scolded her, but she was still wagging her tail that whole time. I wasn't sure if I was going to get mad or laugh. She's adorable. That's so funny that she ate all the cupcakes and the bacon. Happy belated birthday. Lovely Daisy! She is a cute and good looking dog!! Oh my, there is mischief going on in your house. :-D.
Daisy looks like a kind sweet friend! Yeah! What a lovely photo!